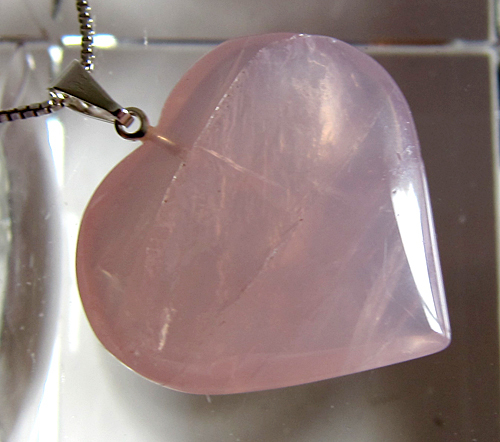 Dimensions (HxWxD): 1.45" x 1.25" x 0.25"
This bright pink rose quartz heart pendant, weighing a little over 1/3 ounce, is nearly 1 1/2 inches high, and displays a luminous quality. 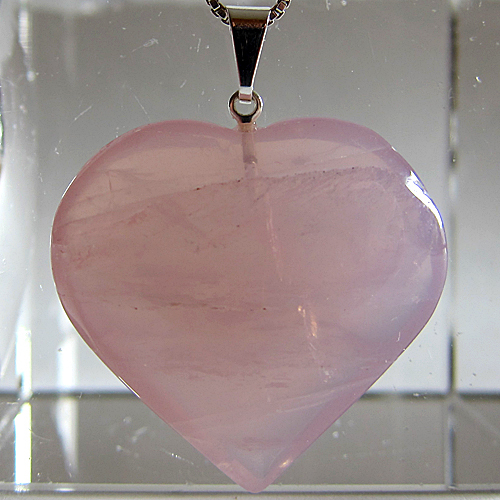 This lovely rose quartz heart comes with a sterling silver chain and a velveteen pendant box, ready to wear when you receive it. This is one the nicest inexpensive crystal heart pendants we've ever seen. Note: weight above is shipping weight. Actual weight is .35 oz. Each piece is unique & may vary slightly from photo. Each piece is guaranteed to be beautiful and to meet with your complete satisfaction!